From physics to engineering to neuroscience, resonance is a common phenomenon of all waves and vibrations. From atomic and particle vibrations to bridges and skyscraper vibrations to neuronal waves, resonance is based on heterogeneous responses of oscillating systems to inputs with different frequencies. However, in comparing different oscillations an important question arises: Is resonance a prerequisite feature of all oscillations or it is a by-product of these oscillations? Coherent oscillations in mammalian brain are correlated with different behavioral states of the brain [11, 13, and 32]. Also different rhythms have many common features in an individual. In fact, through evolution, their roles and features in different animals have been persisted. For example, the hippocampal theta waves are found in every mammalian brain [11, 32]. One the most important functions of neuronal rhythms is synchronization of inputs. In fact, oscillation-based synchronization is the most efficient mechanism for the temporal coordination of stimuli [13, 32]. Another important role of brain oscillations is to segregate neuronal subpopulations from the network during different behavioral states [13, 31 and 32]. Neural oscillations are also important in memory formation and memory recalling [13, 32]. As an example, hippocampal theta waves are believed to be in close relationship with place-specific discharge of hippocampal pyramidal neurons and may act as a mechanism for information processing, memory formation and recalling [11, 30-34]. Overall, extensive neuronal waves provide harmonious context for activity of individual neurons and may produce synergy between behavioral state of nervous system and physiological state of its individual components. Generally, three mechanisms may be responsible for generation of rhythmic oscillations in a population of neurons: i) Dynamics of ionic currents are the intrinsic bursting mechanisms in a pacemaker neuron that eventually lead to oscillations in neuronal population. The other bursting neurons in central pattern generators commonly follow the rhythmic frequency of the pacemaker neuron. For example, pyloric rhythm in stomatogastric ganglion of crustaceans is generated by AB and PD neurons. The pyloric rhythm and bursting of other neurons in this central pattern generator is governed by the frequency of AB/PD neurons. Interestingly, subthreshold oscillation in individual neurons can have different frequency from the network frequency . ii) Dynamical interplay (i.e. excitatory and inhibitory synapses) in a neuronal network may lead to neuronal oscillations. Half-center oscillators are among this group. Half-center oscillator consists of two neurons that produce a rhythm, where each individual neuron, if disconnected, is unable to generate the rhythm. In most cases, the two neurons of half-cycle oscillators are reciprocally coupled through inhibitory synapses . 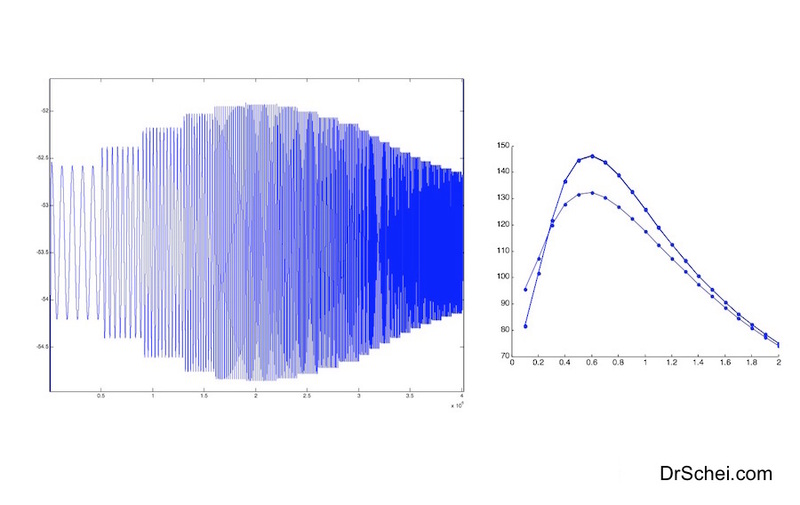 A classic example of half-center oscillator is gating CPG. iii) Combination of intrinsic electrical properties and synaptic properties in a neuronal population generates oscillations. Mammalian hippocampal waves (i.e. theta and gamma waves) are generated by this mechanism . Resonance is the tendency of a neuron to produce amplified responses to oscillating stimuli, if the stimuli have a certain range of frequency. This frequency is called preferred resonance frequency or natural frequency or eigenfrequency . This temporal filtering of signals based on their frequency is a phenomenon that occurs in various stages of nervous system . There are two types of resonance in neurons: synaptic resonance and subthreshold membrane resonance [1, 28]. For a neuron to have synaptic resonance, the synapse requires to contain both facilitation and depression mechanisms in its responses following a train of stimuli. In the case of subthreshold resonance, the stimulus is applied current and the neuronal response is membrane potential. As discussed by Drover et al (2007), synaptic and membrane resonance may interact with each other to produce the combined neuronal resonance . The combined neuronal preferred resonance frequency lies between its preferred synaptic resonance frequency and its subthreshold membrane resonance frequency . Because the main focus of this review is on subthreshold resonance, we may use the term “resonance” instead of “subthreshold resonance” in this review, unless otherwise stated. According to the Ohm’s law, the ratio of voltage response to a given square pulse of current is constant and equals to the resistance of the cell. However if the cell is injected by alternating current (AC), such as sinusoidal current, this ratio is called impedance. In fact, impedance is the extension of concept of resistance into AC circuits. Impedance contains both magnitude and phase which are functions of driving frequency [1, 24]. Also impedance consists of both real and imaginary numbers . For calculating magnitude of impedance, which is frequency dependent, it is necessary to obtain the fast Fourier transform of the input (i.e. sinusoidal applied current) and output (i.e. recorded oscillating voltage) [1, 2, 3 and 28]. Therefore, one would be able to transform these properties from time domain to frequency domain . In the plot of impedance profile versus frequency, resonance is the maximum magnitude of impedance. In other words, resonance is enhancement of the outputs in a narrow range of inputs frequency. The specific frequency corresponding to this enhancement is called preferred resonance frequency [24, 29]. Synaptic plasticity has been reported in many synapses, in the forms of facilitation and depression. In these synapses, the post synaptic response to a train of stimuli is different from the response to a single stimulus [1, 36]. In the case of facilitation, the synapse enhances as much stimuli as it receives; and conversely, in depression, the more signals the synapse receives, it may become more attenuated. More importantly, the magnitude of facilitation or depression not only relies on the number of spikes in the driving train, but depends on the frequency of inter-spike intervals. In fact, facilitation acts as high-pass filter and depression is a low-pass filter [1, 36]. Therefore, similar to subthreshold resonance, the combination of facilitation and depression in a synapse form the band-pass filter corresponding to resonance frequency . Interestingly, while the preferred subthreshold resonance frequency in a neuron is similar in all sections of the cell, different synapses in a neuron may have different synaptic resonant frequencies . Therefore, an individual neuron may selectively set its firing rates in different synapses, to different frequencies and selectively affect postsynaptic neurons. According to this hypothesis proposed by Izhikevich (2003), neurons benefit from resonance to elect their companions to transfer oscillations containing information . One of the key features of oscillations in nervous system is their specific frequency and resonance may be the key factor in governing frequency of oscillations in central pattern generators. As discussed by Tohidi and Nadim (2009), the network frequency is correlated with membrane resonance of pacemaker neurons . Interestingly, the network frequency and membrane resonance of pacemaker neurons are not solely sensitive to intrinsic electrical properties of pacemaker neurons (i.e. properties of ionic currents), but also depend on voltage ranges and waveforms of oscillations . Another function of resonance, especially in cortical neurons, is to modify the dynamics of network. As an example that discussed by Marshall et al (2002) and by Buzsaki and Draguhn (2004), different cortical neurons (i.e. interneurons and pyramidal cells) have different preferred resonant frequencies. The pyramidal-interneuron synapse filters out high frequency and low frequency presynaptic spikes (in pyramidal neurons) and has resonance frequency of 5-25 Hz [13, 30]. The frequency of the active place cells is also high and around the same range (that is much higher than other pyramidal cells spiking). Therefore, the firing of active place cell has more effect on the interneuron than the other pyramidal cells. Subsequently, the place cell “enslaves” the interneuron and the interneuron inhibits other pyramidal cells. This is an example that resonance may adjust the network configuration. Another function of resonance is to accumulate weak signals with certain frequencies. An example of this phenomenon is summation of cortical feedback signals from cortex to thalamus . This leads to amplified thalamocortical signals. In this case, weak spindles during deep phases of sleep accumulate and because they are in a preferred range of frequency, they suppress the responsiveness of thalamic neurons to external stimuli (containing different frequencies) . A clinical example of resonance is in neuropathic pain. Ectopic spikes generated in sensory dorsal root ganglia are initiated by subthreshold membrane oscillations and are amplified through damages in myelinated axons. Resonance is generated by TTX-sensitive Na current, voltage-gated K current and leak and is important in generation of subthreshold oscillations. Therefore, resonance is considered as one of the suspects in neuropathic pain . Resonance is generated through the interaction of neuronal passive properties and dynamics of voltage-gated currents. The passive properties are membrane capacitance and instantaneous leak conductance that form neuronal time constant . In different resonant neurons a series of voltage-gated currents has been proposed to play role in resonance. These currents produce active properties of the cell and they activate near the resting membrane potential. Therefore the active properties of the cell are voltage-dependent. Persistent sodium (NaP), Hyperpolarization activated inward current (Ih) and Transient calcium current (ICaT) are among the ionic currents that may play key roles in generation and/or amplification of membrane resonance [12, 22, 23 and 29]. As mentioned by Hutcheon and Yarom (2000), passive properties of neuron act as low-pass filter and filter out inputs with high frequencies. In contrast, active properties of neuron may act as high-pass filter and filter out inputs with low frequencies. Together, the combination of the two opposing effects (low-pass filter and high-pass filter properties), if connected appropriately, may form a band-pass filter that enables the neuron to produce resonance [9, 13 and 29]. Two types of ionic currents play role in resonance: resonance currents and amplifying currents. Resonant currents are currents that by their activation and inactivation may produce resonance . Amplifying currents enhance the resonance. Classically, Ih and slow K current are considered as resonant currents and NMDA current and persistent sodium currents are considered as amplifying currents. Also Calcium may demonstrate both behaviors . Low-threshold Calcium current has both activation and inactivation. Its activation dynamics is fast and the inactivation is slow. As calcium current is always inward and depolarizing, its activation acts as amplifying mechanism; while its inactivation is responsible for generation of resonance [28, 38]. Examples of resonance based on this current are neurons in inferior olive  and thalamic neurons [17, 28 and 38]. As proposed by Hutcheon and Yarom (2000), repolarizing currents with slow dynamics may be responsible for resonance. Due to slow dynamics, these types of currents decrease neuronal excitability in low frequencies and in combination with passive properties of the cell, produce resonance [17, 28]. Both M current and h current are non-inactivating and are active in subthreshold range of voltages. However their activation curves looks mirror shape of the other: M current activates in depolarizing voltages and deactivates in hyperpolarizing voltages that its reversal potential is. In contrast, H current activates in hyperpolarizing voltages and deactivates in depolarized voltages. Also its reversal potential is in depolarized voltages. Both their activation and deactivation are slow and the time constants are in the range of 100-500 milliseconds. M current consists of potassium and is an outward current, whereas H current is a nonspecific cationic current and flows inward. Overall, these currents may individually serve to stabilize membrane potential [11, 22]. H current is perhaps the most cited current in resonance literature. In majority of resonant neurons, h current is believed to be responsible in generation of resonance. Examples of resonate neurons based on this current are: pacemaker neurons in stomatogastric nervous system of crustaceans [2, 3], CA-1 pyramidal cells in mammalian hippocampus [4, 11, 19 and 22], entorhinal cortex stellate cells [4, 21, 23 and 26] and etc. Slow potassium current is shown to be responsible in generation of theta frequency resonance in granule cerebellar cells [4, 17]. Also this current may be responsible for subthreshold resonance in amygdale, neocortex and cerebellar neurons [11, 18]. Also M current is isolated in hippocampal neurons of different mammalian brains. Together with h current, it may be responsible for resonance in theta frequencies in pyramidal cells [11, 19]. In humans, mutations in the gene of the corresponding channels of this current lead to neonatal epilepsy due to deceased levels of M current . In addition to mentioned calcium independent TEA-insensitive currents, a calcium-dependent version of potassium current (IAHP) is responsible for resonance in some invertebrates neurons [17, 35]. Persistent sodium current is one of the key currents in resonance in mesencephalic V neurons [20, 25], entorhinal cortex stellate cells [21, 23 and 26] and CA-1 pyramidal cells . Similar to the conventional sodium current that appears in Hodgkin-Huxley equations, this type of sodium current is Tetrodotoxin-sensitive and has activation curve similar to sodium: It activates fast in more depolarized voltages and deactivates in resting and hyperpolarized voltages. Unlike the conventional sodium current, this current is non-inactivating. It is still unclear that this current gates through same classical sodium channels or through some distinct types of channels [11, 25]. As many studies including Gutfreund et al (1995) demonstrated, blocking of this current by TTX depresses the magnitude of impedance in cortical neurons of guinea-pig . Due to its fast dynamics it usually acts as amplifying current [28, 37]. Many neurons display subthreshold resonance in their response to driving current. Beside the list of neurons in mediodorsal thalamus, entorhinal cortex and hippothalamus, many neurons in invertebrates also show resonance. One of the well-studied examples of resonance is in neurons of Stomatogastric nervous system of crustaceans (i.e. crab cancer borealis). In fact, because of several advantages of this system (i.e. minimal number of neurons in a CPG, relatively large size of neurons, and known intrinsic and synaptic properties of neurons) this system has been one of the best well-known central pattern generators. In this network, both pacemaker neurons (AB and PD) and follower neurons (i.e. LP neuron) exhibit both types of synaptic and membrane resonance [2, 3 and 36]. Several voltage-gated current, such as h current has been proposed to play role in this resonance effect . In entorhinal cortex (EC), superficial layer II contains stellate cells and layer III has pyramidal cells, both with resonant properties. These cells send projections to dentate gyrus and CA1 regions [9, 14 and 32]. As demonstrated by Erchova et al. (2004), layer II stellate cells have strong resonance in upper theta frequency range (5-15 Hz); while layer III pyramidal cells have weak resonance at very low frequencies (~1 Hz). So in theta frequency, as driving frequency increases, impedance monotonically decreases [14, 23]. Following a depolarizing or hyperpolarizing step current, all resonant cells demonstrate sag potential . As discussed by Rotstein et al (2008), resonance in stellate cells requires the presence of h current and persistent sodium current [23, 26]. Hippocampal pyramidal region consist of pyramidal cells and several types of interneurons. The importance of this region is because hippocampal theta waves with 4-10 Hz frequency are generated here. Gamma waves with 40-70 Hz frequency are mostly superimposed on theta waves. Isolated hippocampal CA-1 pyramidal neurons show resonance with theta frequency . In addition, whole cell clamping in thin slices of CA-1pyramidal neurons show resonance in these neurons with the preferred resonant frequency of 2-5 Hz [11, 12 and 13]. Similarly, horizontal interneurons with cell bodies in stratum oriens have resonant frequency around 1-5 Hz. However, the majority of interneurons in pyramidal layer are fast spiking interneurons (including basket cells and axo-axonic interneurons) and their resonant frequency is around gamma band (~ 40 Hz) . As mentioned before, CA-1 pyramidal neurons contain both M current and h-current that may be responsible for generation of subthreshold resonance in theta-range frequencies: . As discussed by Pike et al. (2000), unlike pyramidal cells and horizontal interneurons, resonance in fast spiking interneurons is Tetrodotoxin sensitive. This suggests a possible role for voltage-gated sodium current in resonant behavior of gamma-band spiking interneurons and diminishes the role of this current in resonance of pyramidal neurons . Interestingly, as shown by Hu et al. (2002), the resonance in CA-1 pyramidal cells has a U-shaped dependence on voltage: The bottom is around the resting potential; However the maximums are at hyperpolarized and subthreshold voltages . The resonance of hyperpolarized voltages is generated by h current; while the resonance in subthreshold voltages is generated by M-current and persistent sodium current . Also as demonstrated by Narayanan and Johnson (2008), based on the activity and location of CA-1 pyramidal neurons, h current affects the resonant frequency . In a neuronal population, different subpopulations of neurons are not homologous and they do not respond uniformly to an input. In fact, due to their heterogeneity, they may have distinct preferences to various patterns of inputs and may have different resonant frequencies. For example, pyramidal neurons have preferred resonant frequency around 1-10 Hz, close to theta rhythm frequency. Similarly, horizontal interneurons with cell bodies in stratum oriens have a resonant frequency of​ about 1-5 Hz. However, the majority of interneurons in the pyramidal layer are fast spiking interneurons and their resonant frequency is around gamma band (~ 40 Hz) . Therefore, in the CA1 pyramidal layer, individual neurons may act as band pass filter and selectively filter out oscillations with undesirable frequencies. Consequently, a combination of neuronal oscillations containing various frequencies may be filtered out and classified locally by resonant behavior of different subpopulations of neurons . Overall, in conjunction with the hypothesis proposed by Izhikevich (2003), resonance may act as a selecting tool for both sides of a synapse: a neuron may pick up a signal with desired frequency from a pool of oscillations and it may select the neuron it wants to influence. Wang X-J, Rinzel J (1999) Oscillatory and bursting properties of neurons. In: The handbook of brain theory and neuronal networks (Arbib MA, ed), pp 686-691. London: MIT Press.